This article is about the cannons that can launch the player a certain distance. For information about the variant of Bill Blasters that appear in Super Mario Land, see Bill Blaster § Super Mario Land. For Luigi's Special Shot in Mario Tennis Aces, see Special Shot § Pipe Cannon. A Pipe Cannon from New Super Mario Bros. Shoots players to another part of the level. Pipe Cannons are Warp Pipes that appear throughout the Mario franchise. When entered, they launch the player to another location (usually another part of the level). Pipe Cannons first appear in Super Mario World, where they are always on a slant and fire the player to far places (about two or three screens away). These pipes cannot be entered and are always exited via a different pipe, usually from an underground area. Pipe Cannons reappear in New Super Mario Bros., where they are similar to the Warp Cannons that are used to travel to a different world, except they fire the player within a much smaller range. 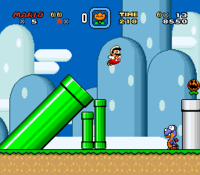 To use these pipes, unlike in Super Mario World, players enter one and then are automatically fired off, often to an unreachable ledge, platform, or even a different area. Pipe Cannons reappear in New Super Mario Bros. Wii, retaining the same functionality from New Super Mario Bros. Another type of Pipe Cannon makes an appearance in the 1-up Blast mini-games, where the player(s) can enter these cannons and aim before they blast themselves and attempt to pop balloons to earn 1-Ups. 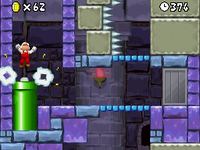 Pipe Cannons reappear in New Super Mario Bros. 2, where they function the same as they did in New Super Mario Bros. A Pipe Cannon is also used to reach the Rainbow Course. Pipe Cannons reappear in New Super Mario Bros. U, where there are Pipe Cannons on the world map in each world, which are used as shortcuts to completed worlds, or to get to the Secret Island and Superstar Road. After the level Stone-Eye Zone is beaten and Nabbit is seen stealing Toad's power-ups Toad uses a Pipe Cannon in order to quickly travel to Acorn Plains, unlocking Pipe Cannons for regular use in the world map. In the levels themselves, Pipe Cannons function the same as in previous installments. Pipe Cannons reappear in New Super Luigi U, where they function the same as they did in New Super Mario Bros. U.
Cannons similar to Pipe Cannons appear in Super Mario 3D World, being Clear Pipe Cannons, having the ability to launch the player in a very similar manner to Pipe Cannons. Additionally, another similar cannon appears, called the Cloud Cannon, which, when jumped into, produces a white Pipe Cannon that launches the player into a Coin Heaven. In the Remix 10 mode of Super Mario Run, on random occasions, when entering a pipe to go to the next area on the map screen, it may turn out to be a Pipe Cannon, launching the player into the sky. A Pipe Cannon appears in Mario Kart DS in the course Airship Fortress which contains a Pipe Cannon, which shoots the player to the tower near the Airship. A Pipe Cannon reappears in Mario Kart 7, having the same function as it did in Mario Kart DS. In Mario & Luigi: Bowser's Inside Story and Mario & Luigi: Bowser's Inside Story + Bowser Jr.'s Journey, Pipe Cannons appear throughout a handful of areas inside Bowser's body, functioning the same as in the 2D platformer games. A Pipe Cannon appears in Mario Tennis Aces, where Luigi shoots out of a Pipe Cannon in his Special Shot. ↑ Mario Mania, page 120. ↑ Stratton, Steve (November 18, 2012). New Super Mario Bros. U: Prima Official Game Guide, pages 124 and 181. ↑ Shogakukan. 2015. Super Mario Bros. Hyakka: Nintendo Kōshiki Guidebook, pages 60 and 118. ↑ Shogakukan. 2015. Super Mario Bros. Hyakka: Nintendo Kōshiki Guidebook, pages 150, 200 and 216. This page was last edited on March 29, 2019, at 05:03.